Categories are how books are sorted out at the library, or at a bookstore. Lots of times there are certain descriptions that fall out favor: "I've seen enough chick lit, I never want to see another book of chick lit again" from an editor means that my novel is NOW categorized as something different. It's the same book but I'm not letting too many pepto bismal pink covers get in the way of making a sale. In a cover letter I'd stick as close to category as possible. You can't call a memoir “science fiction” unless you’re born on Mars or beyond and you can't call a biography “fiction” so try to be accurate, but don't pigeonhole yourself. Hen lit, marriage lit, lad lit, all are horrid names and I hate them. I like "rip roaring, page turning, keep you glued to the couch, compelling fiction". Since Miss Snark has no sense of humor she didn't know this. You should definitely read Dave Barry. Very, very funny. As a horror/dark fantasy fan, I find the categories at the bookstore rather disturbing. I find myself digging through several different areas before I find what I want. Considering the number of works out there that fall into this category, it seems that they could at least do the customer the curtesy of assigning a sub category and placing them together for greater ease of purusing. Prime example, last week at Barnes & Noble, I picked up horror books, in Fiction & Literature, Science Fiction and Mystery. It just seems like there would be an easier way to sort categories. Your blog is sweeeet, as my twelve-year-old would say. When to NOT send a book proposal? 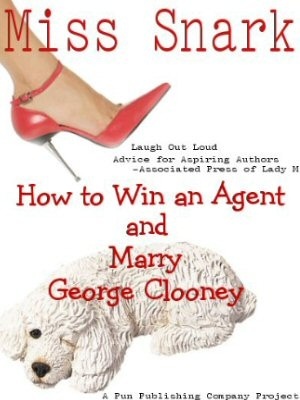 Mr Clooney in elevator with Miss Snark! It Ain't Easy Being Greeeeeen!